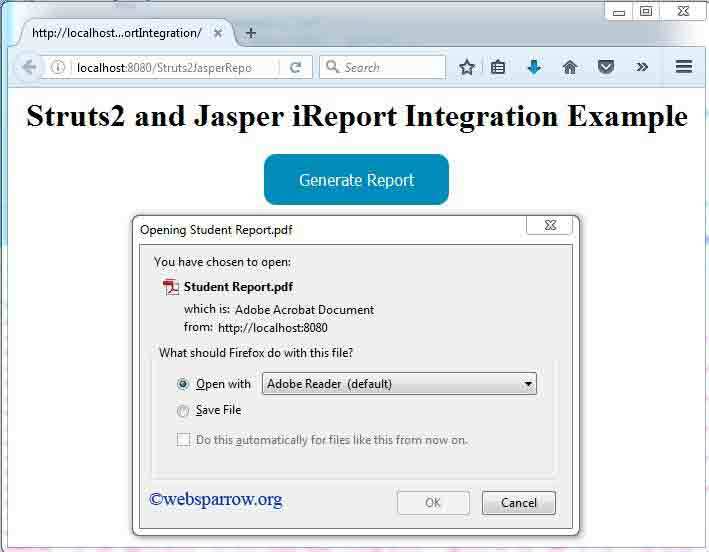 This struts 2 tutorials explain how to integrate Jasper iReport in your dynamic web application to generate the PDF report. 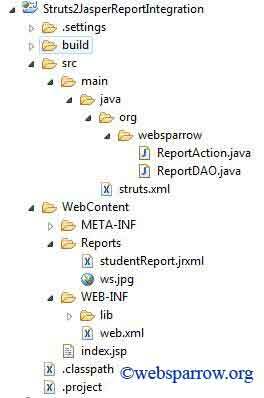 Before starting the coding, we need to include Jasper iReport JAR dependency in Struts 2 project. Struts 2 and Jasper iReport integration required these jar files. Step- 1: Very first step is to create the table script. 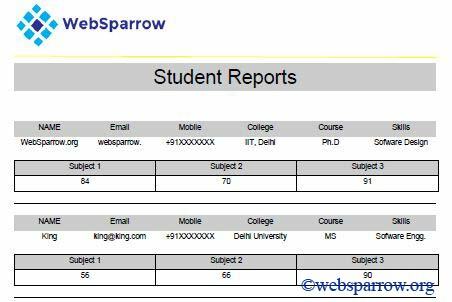 Step– 2: Design your report. <reportElement x="0" y="0" width="208" height="59"
<reportElement x="0" y="69" width="552" height="2"
<reportElement mode="Opaque" x="0" y="0" width="552"
<reportElement x="0" y="71" width="185" height="20"
<reportElement x="185" y="71" width="185" height="20"
<reportElement x="370" y="71" width="185" height="20"
<reportElement mode="Opaque" x="0" y="51" width="185"
<reportElement mode="Opaque" x="185" y="51" width="185"
<reportElement mode="Opaque" x="370" y="51" width="185"
<reportElement x="0" y="20" width="92" height="20"
<reportElement x="92" y="20" width="92" height="20"
<reportElement x="184" y="20" width="92" height="20"
<reportElement x="276" y="20" width="92" height="20"
<reportElement x="368" y="20" width="92" height="20"
<reportElement x="460" y="20" width="92" height="20"
<reportElement mode="Opaque" x="0" y="0" width="92"
<reportElement mode="Opaque" x="92" y="0" width="92"
<reportElement mode="Opaque" x="184" y="0" width="92"
<reportElement mode="Opaque" x="276" y="0" width="92"
<reportElement mode="Opaque" x="368" y="0" width="92"
<reportElement mode="Opaque" x="460" y="0" width="92"
<reportElement x="0" y="107" width="552" height="1"
Step– 3: Include all required jars in the project lib folder. Step– 5: Create a DAO class. Step– 6: Create Action class. Step– 7: Design your User Interface page. Step- 9: Finally all is done, now start your server and run the project. Find the URL to test the application localhost:8080/Struts2JasperReportIntegration/. We will get the output as given below.